Paul Dargan has sent me this interesting post on a clever trap that can net Black an early point in the Morra Gambit. It's worth learning the pattern: it came up in one of my Internet blitzes this morning, from a game that started as a Benoni. Paul got a chance to re-analyse the trap on a recent trip to Amsterdam, about which we'll post more later. But what's this? Isn't Black meant to curl up and defend, trying to win with his extra pawn? and Black is going to net the White Queen for two minor pieces due to the mate threat on h2. 9.Nb5 (Nd5 also gets played sometimes) Qb8 10.h3 h5 11.g3 from the diagram. 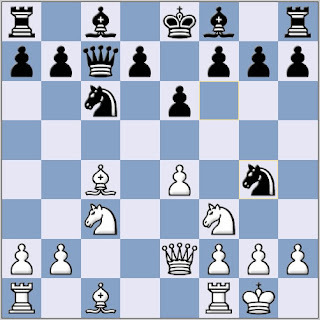 Or earlier deviations by White, especially 8.e5 Ng4 9.Bf4 d5 (f6?! Has a worse reputation) 10.Bd3 when both Bb4 and Nb4 are worth investigation." Is this trap one of the reasons you don't see the Morra in GM games ? there are a lot of good lines for Black in the Morra - GMs will be armed with the knowledge of the intricacies of one or two of them. Once they've negated White's early initiative and tricks, Black typically emerges either with an extra pawn, or a better position, and sometimes both.